The book brings little publicized scientific data regarding the ethno-cultural heritage of the ancient Macedonians in today's Macedonian nation. 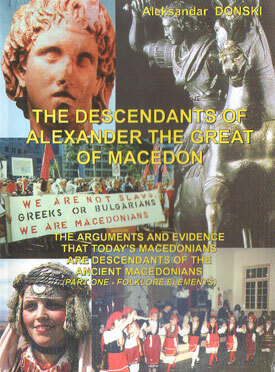 Through this book the audience from the English speaking world, for the first time will have an opportunity to learn that today's Macedonians are the same people with the famous ancient Macedonians of Alexander and Philip the Great. The text is specially adapted for the English-speaking audience (including descriptions of Macedonian terminology unfamiliar to them etc.). The book includes an extensive introductory section covering the whole of the Macedonian history to familiarize the western audience with the country and the people. - Today's Macedonians anthropologically differ from the ancient Slavs. It is well known that the Byzantine historian Procopius (who was their contemporary and had personally came upon them) clearly described the ancient Slavs as tall people and having a strong stature. Procopius also wrote that they were all and one blond and that there weren't any with a different colour of the hair. It is obvious that the majority of the Macedonians today have different anthropological features. -There are also clear Byzantine documents according to which in the VIII century Tzar Justinian II moved out a large number of Slavs from Macedonia, but this information was not discussed in Macedonian historiography. -It should be noted that the Slavs were not "people from the other side of the Carpathians" (as we were thought until recently), but descendants of the Veneti, ancient people with grand culture. Veneti were even referenced by Homer, and were later also referenced by Herodotus as people from the Balkans. This fact has been long recognized by the world science and from recently has been included in the history textbooks in Republic of Macedonia. -In the Macedonian folklore there are large number of songs, poems, tales, legends and narratives with an ancient-Macedonian contents registered as early as the 16th, 18th, 19th and 20th centuries. The contents and details in some of these works are in astonishing agreement with the historical events. -In one folklore song about Alexander The Great of Macedon recorded in the 19th century, mosquitoes (malaria) have clearly been identified as the reason for Alexander's death even though it has been scientifically proven that mosquitoes carry the malaria disease only in the early 20th century! -In the 19th century Miladinov brothers recorded a narrative about the founding of the town of Voden, which is in complete agreement with the historical description by the ancient historian Justin despite the fact that his work has not yet been translated and published in Macedonian. -There are numerous folk creative works in the Macedonian folklore dedicated to some of the ancient-Macedonian rulers. There are also certain folklore elements (especially in the tales) that without doubt have their roots in ancient Macedonia. Some of those elements are: the motif of the lion (lions in fact lived in Macedonia in the ancient period and that is the reason why the lion has been widely appears in the Macedonian tales as well as in the heraldry); the tsar with a horn (in a tale about Alexander of Macedon recorded by Tsepenkov); the lynx; the philosopher; the motif of the three brothers (taken from the Herodotus' story about the founding of the Macedonian State); the belief that the crow brings bad fortune and the eagle brings victory etc. All this is explained and argumented in the book. -On the other hand, in the Macedonian folklore and people's collective memory one can not find even a single memory of our alleged "life on the other side of the Carpathians". Furthermore, the ethnonim "Slavs" had not been mentioned at all, not even in a single Macedonian folk lore! -There are a large number of customs, rituals, ceremonies and popular beliefs that remained from the ancient Macedonians among Macedonians in the 19th and 20th centuries. For example, Herodotus wrote that at the festivities in ancient Macedonia the men sat separate from the women. This custom has also been registered by the recorders of Macedonian folk creative work in the 19th and 20th centuries, and it is still practiced today. We have the custom of breaking a loaf of bread during the marriage ceremonies that has also remained from the ancient Macedonians. This custom was mentioned by the biographer of Alexander the Great of Macedon Quintus Curtius Rufus. Consideration of the men's waistband from the folk apparel as a symbol of manhood is another custom that remained from the ancient Macedonians (this was recorded by Aristotle and the same custom was recorded in Macedonia in the 19th century). Bestowing a ring to the heir before one's death is a custom that was practiced by the ancient Macedonians and is still practiced today, as it is the case with cutting the hair in moments of great sorrow. Even the ancient Macedonian custom of electing the king (carried out by army assembly and election by acclamation) endured among the Macedonians from the 19th century as a custom of selecting the village leader. Ancient-Macedonian elements are also present in the celebrations of the following holidays: Lazara, Gurgovden, Rusa Sreda and Prochka. Ancient-Macedonian elements are present in Macedonian customs for calling rain. The belief in the magical power of the snake also came down from the ancient Macedonians, as well as a number of burial customs and so on. All this is elaborated in detail in the book through comparative review of citations from ancient authors and the recorders of Macedonian folk creative works from 19th and 20th centuries.